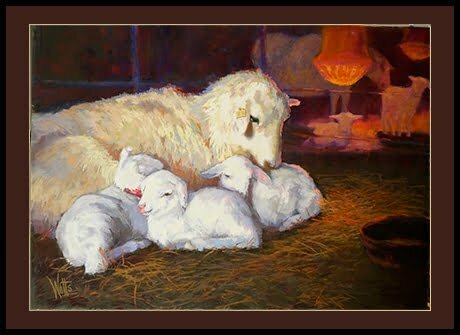 The ewe in this painting lives on Stauber Farms, Bethania, NC, a North Carolina Heritage Farm in the western part of the state. Her triplets were born the night before this scene was recorded. The heaters in the two stalls behind are there because the lambs were born during a cold spell in April, 2014. Like the ewe pictured above, this breed is being revived, genetically managed, and preserved in the US by a group of dedicated farmer-conservationists, who may be located on the Breeders List of this association. A giclee print of this painting is now available for $115 with free shipping in continental USA. The print is 18″ X 24″ on a 24″ X 29″ heavy rag paper stock, printed in a professional photography print studio. These are individually printed, signed and numbered when ordered, in a limited edition of 100. Fifteen dollars of the price is forwarded to the St. Croix Hair Sheep Breeders.